Reduced uterine perfusion pressure during pregnancy is an important initiating event in preeclampsia. Inflammatory cytokines are thought to link placental ischemia with cardiovascular and renal dysfunction. Supporting a role for cytokines are findings of elevated tumor necrosis factor (TNF)-α and interleukin (IL)-6 plasma levels in preeclamptic women. 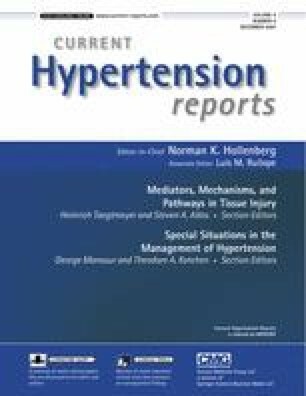 Blood pressure regulatory systems (eg, renin-angiotensin system [RAS] and sympathetic nervous system) interact with proinflammatory cytokines, which affect angiogenic and endothelium-derived factors regulating endothelial function. Chronic reductions in placental perfusion in pregnant rats are associated with enhanced TNF-α and IL-6 production. Chronic infusion of TNF-α or IL-6 into normal pregnant rats significantly increases arterial pressure and impairs renal hemodynamics. TNF-α activates the endothelin system in placental, renal, and vascular tissues, and IL-6 stimulates the RAS. These findings suggest that inflammatory cytokines elevate blood pressure during pregnancy by activating multiple neurohumoral and endothelial factors.